Cleveland Browns parking rights are not transferrable, however single game and season long Browns parking passes are free to be bought and sold. If you are a Browns PSL holder and would like to see about adding parking rights to your account, please contact your Browns ticket representative for further details and availability. *Availability subject to change. Check back soon if we are currently out of stock. Or, sell your pass to us! Large/Oversized Vehicle Parking - Dock 20 can accommodate Buses, RVs, and Motor Home parking. Camper & Limo Parking is $40.00, Large Busses and Motor Home parking is $65.00. Parking is sold on a first come first serve basis. Browns Handicap Parking - Cleveland Browns Stadium offers two (2) handicapped drop off locations at the Southeast and Southwest corners of the stadium. A limited amount of ADA Handicapped parking is available in the West 3rd Street Parking Lot on a first come first serve basis. What is the Cleveland Browns transfer fee and when can a PSL be transferred? The Cleveland Browns charge a transfer fee of $25 per seat. Transfers will be processed between January 1st and April 1st in the Cleveland Browns ticket office. However, PSL Source processes transfers year-round. How do I sell Cleveland Browns PSLs? List your PSL with us. To see what others are selling for, check out our available inventory of Cleveland Browns PSLs. How do I buy Cleveland Browns PSLs? We have a large inventory of Cleveland Browns PSLs available at PSL Source. Check out our Cleveland Browns PSLs page for more details. How do I sell Cleveland Browns tickets? To sell your individual game Cleveland Browns tickets, please check out our Sell Cleveland Browns Tickets page. How do I buy Cleveland Browns tickets? 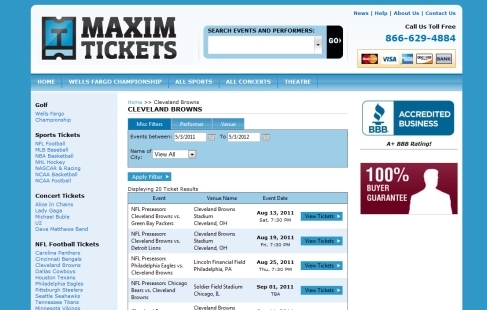 To purchase single game Cleveland Browns tickets, please visit our ticket partner MaximTickets.com. Where Can I find more information on parking at Cleveland Browns FirstEnergy Stadium? For more information on Cleveland Browns parking or to purchase single game or season long parking for the Cleveland Browns at FirstEnergy Stadium, please check out our Cleveland Browns Parking page at PSL Source.